The Truth About Nelena: Only In The Oct/Nov Issue Of J-14! 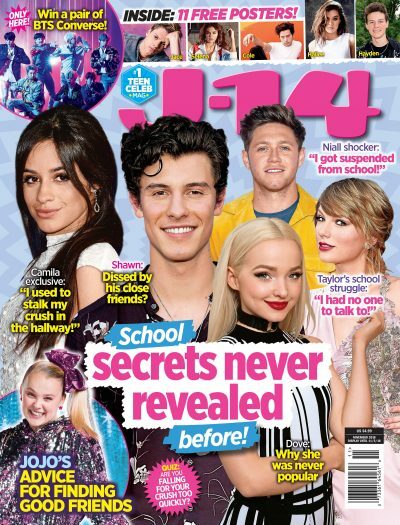 Slip on your favorite knit sweater and grab the Oct/Nov issue of J-14 for your celeb fall flirt alert! Demi Lovato dishes on her very first date! "I didn't know if he'd kiss me…" Eek! You have to hear how it ends! Selena Gomez spills: "He had a rose in his hand, just one." Hmmm… is she talking about Nick Jonas? Snag the issue to find out! Only in J-14 will you find the truth about Nelena. We'll let you know what's real and what's not. Don't get guys? Neither does Miley Cyrus! Get the 411, and even enter to win her signed iPod! Sweet! J-14's got an-all access pass to the JoBros' "Burning Up" tour. Get all the behind-the-scenes scoop! Can guys be trusted? Vanessa Hudgens lets fans in on how she tested her relationship with Zac Efron. Plus, we spill HSM3 set secrets! David Archuleta confides in J-14: "I didn't have friends." We'll take you inside Ashley Tisdale's birthday bash and reveal why the Gossip Girl cast is getting fed up with Blake Lively. Missed J-14's V.I.P. InTune event with Push Play and Cody Linley? No worries, we'll catch you up! Scared for your first date? So were Jordin Sparks, Miranda Cosgrove and David Archuleta. Attention fashion lovers: You don't want to miss Taylor Swift's guide to getting gorgeous or our bangin' boot guide! And shhhh! We even give you a sneak peak at an awesome upcoming trend–grab the issue and walk the hallways a total style icon! Plus, J-14 lets the stars show you how to create your own YouTube show. And of course, we've got games, quizzes, tales of truth or dare, horoscopes, embarrassing moments, the J-14 don't miss list, glossy posters and much, much more! Wow! This may be our best issue yet–hurry up and get it today! P.S. The issue hits stands September 22, but some subscribers may already be receiving copies.